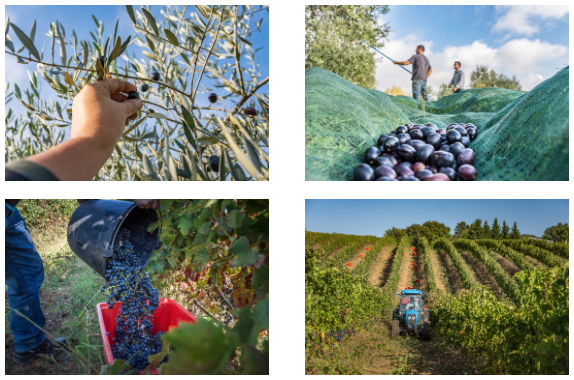 What went on in 2016: Our Olive Oil The Grape Harvest Awards & Events New Webshop & More….. The year 2016 was an extremely productive and satisfying year, in which we were presented with many new challenges, initiatives and satisfactions. We would like to give you a small taste of them….. The grapes were harvested later than usual, due to an unusually warm spring and a very wet summer. The quality of the grapes was excellent, although quantities were slightly lower. What has made it to the cellars is promising indeed! We can’t wait to let you taste them. We attended several interesting wine expos, such as the Vinitaly in Verona and the Mercato dei Vini in Piacenza, a few local events in Orvieto and Città della Pieve but also hosted some of our own at the castle. Just like last year, we will keep you up-to-date on our 2017 events and expos through our newsletters. It was a challenging year for many, as the olive fruit fly and higher-than-average temperatures led many farmers to harvest early. We were blessed with a good harvest this year and have managed to get the best from what our olives had to offer! Check out this video to see what went on! We are very excited and pleased to announce that we now also have a web shop where you can purchase our wines directly online and have them delivered to your doorstep! Especially our “T.” and our “Elicius” have received recognition from a number of leading Italian wine guides. Particularly appreciative of our wines the Guida Veronelli and Vinibuoni d’Italia. The latter has credited our “T.” 2010 with being an exceptional Sagrantino produced outside of the Sagrantino di Montefalco DOC-area.